Dolphin can be yoked to the Royal Shell Carriage! The dolphin securely holds a mermaid in place with its integrated magnet! Dolphin can hold ring in mouth! 1x dolphin, 2x dolphin baby, 1x coral reef, 1x seaweed ring. 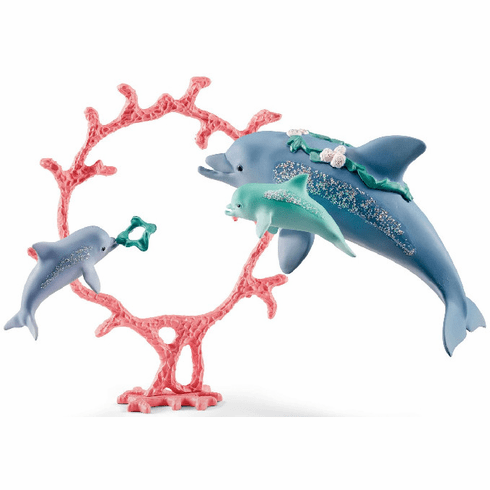 Dolphin mother measures aproximately 5" L x 2" W x 2.75" H. Dolphin calves: 2.1" L x 1.9" W x 1.12" T. Coral Ring: 5" T x 4" W.
Part of the Bayala Series by Schleich.